That may be DLR’s plan, but will their customers accept the move? Surprising what you can find on the internet, if my maths are correct there should be a new set of contracts soon. The above link is to a document on a British government website inviting companies to tender for providing Royal Mail with everything from gravure- and litho-printed stamps to FDCs and filler cards, and phosphor envelopes (which may just mean phosphor bands on postal stationery). The closing date was 8 September 2011, but with an initial 36 month period, extendable twice for 12 month periods. If the contracts were extended for 5 years that would require renewal from some time in 2016. However, now that Royal Mail is a private company, the need to publicise the contacts in accordance with the EU requirements for public sector contracts probably no longer exists. So while we may see a new set of contracts next year, they may not be advertised in the same way. I this why you cannot get English NVIs at present? No. 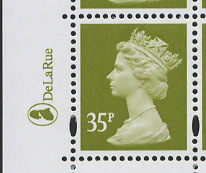 Regional/Country definitives are printed by Cartor, although Tallents House still has De La Rue Northern Ireland 1st & 2nd as these are not by Cartor. There would always be the option of Royal Mail stamp production going to the Debden plant, which is not included in these plans.